The Speaker of the House is not only leader of the majority party, but a representative of the entire legislative body as well. 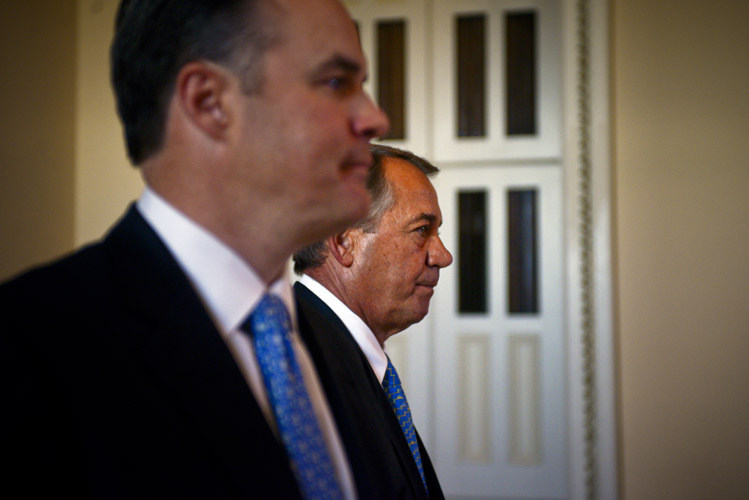 It is the friction between these two roles that has characterized Speaker John A. Boehner’s leadership of the chamber. As the Speaker, he is ultimately the one responsible for finding the 218 votes needed to keep the government moving. 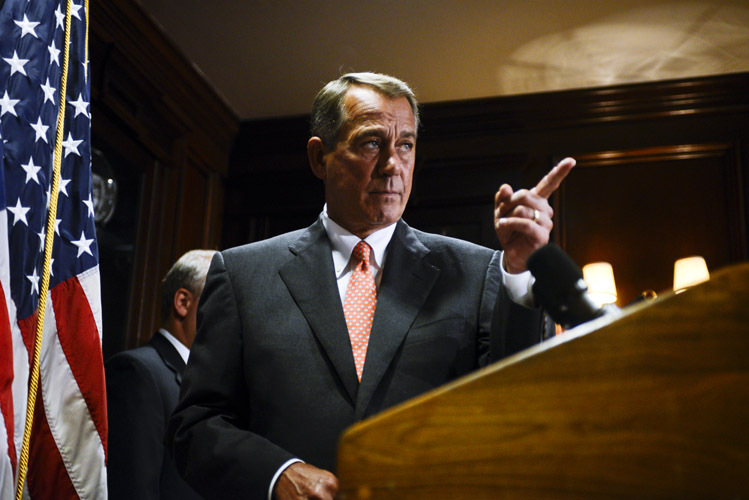 Boehner was swept in to power after the Republican wave midterm election of 2010. Since then, the Republican caucus has been beset by fractious infighting between the party’s right wing and its more establishment-minded bloc. Often times, political circumstances have forced Boehner to choose between two options to get legislation approved: unite his party behind a bill that may be too conservative to overcome a Senate filibuster or seek Democratic Leader Nancy Pelosi’s help in getting the necessary votes but risk enraging members of his caucus. 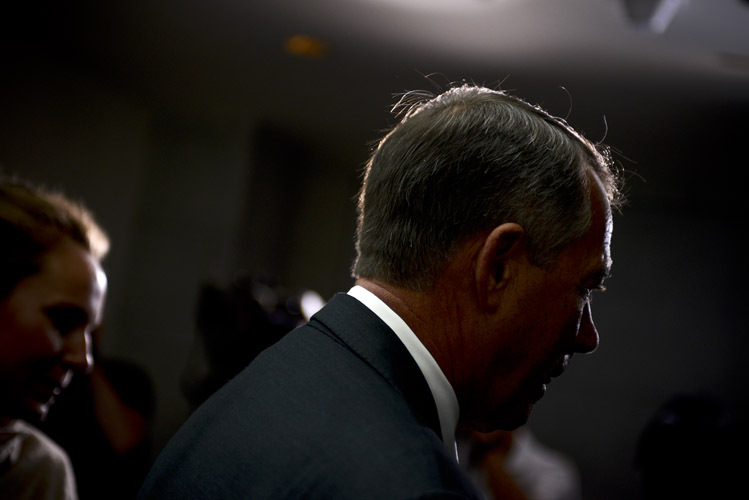 The following photos chronicle Boehner’s speakership, as he balances his management of the House with his stewardship of his party. Boehner heads to a caucus meeting after abruptly pulling a bill that provided funding to deal with the surge in children crossing the U.S.-Mexico border. Conservatives revolted at any measure that could be perceived as an endorsement of the Obama AdministrationÕs immigration policy. With Congress scheduled to recess for the summer in just hours, Boehner needed to quickly find a consensus. 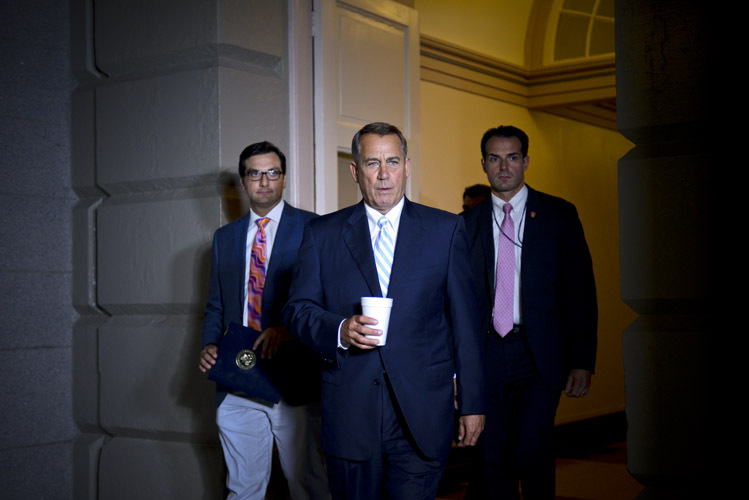 Boehner departs from the gathering after having found an agreement. He called on members to return the next day for a rare Friday vote, much to the chagrin of legislators in the midst of tough reelections and had to cancel flights home. Since President Obama had already promised to veto the legislation, Democrats decried all the drama over what they perceived as a purely symbolic bill. After representatives returned from their summer break, Boehner held a press conference in the Republican National Committee headquarters. With the crucial 2014 midterm election only weeks away, the GOP leadership team laid out their legislative goals for the remaining session of the 113th Congress and their vision for the future. Boehner returns to the Capitol for the "lame-duck" session after emerging victorious from the midterms. When the next Congress convenes, the Speaker will lead the largest House majority in almost a century. 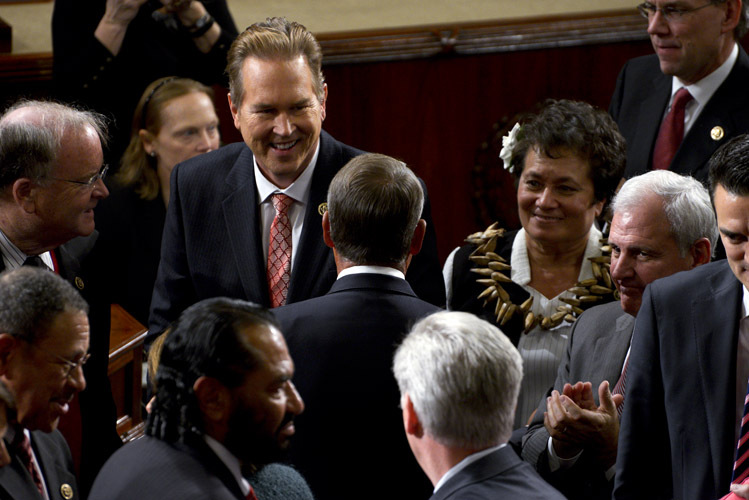 Senate Republicans also captured the majority, giving the party control of both chambers for the first time since 2006. 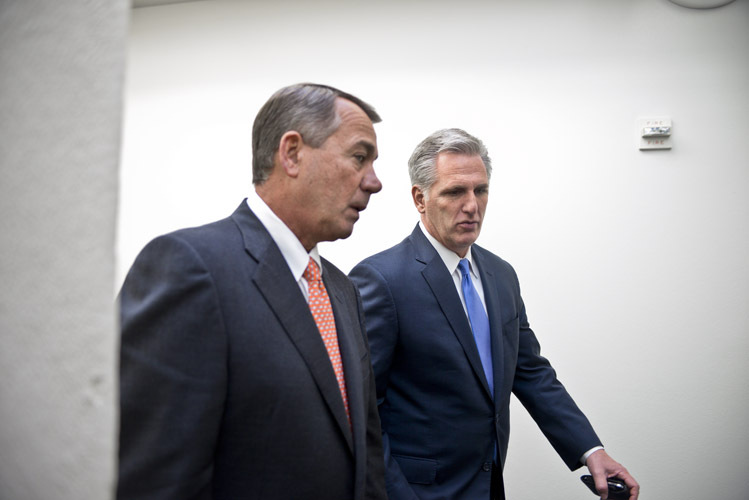 The Speaker walks down a Capitol corridor with Majority Leader Kevin McCarthy. McCarthy ascended to the post of BoehnerÕs second-in-command earlier in the year after the previous leader, Eric Cantor, was stunningly defeated in the Republican primary by Dave Brat. Brat won by convincing the electorate that Cantor was too willing to compromise on important issues. Rep. Alma Adams won a special election in November to fill an immediate vacancy in the 12th district of North Carolina. Boehner greets Adams and her large family shortly before he ceremonially swears her in to office. On the first day of the 114th Congress, after a long holiday recess, members gathered on the House floor to greet Boehner as his entrance is announced. They momentarily will be called upon to nominate and elect a speaker to lead the new session. 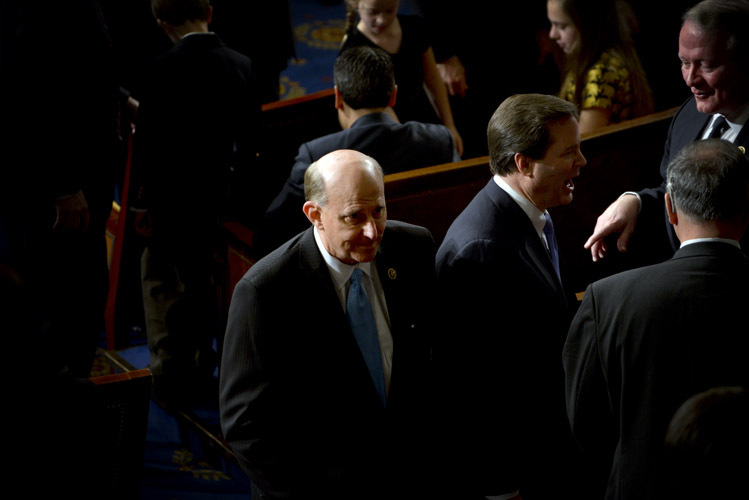 Rep. Louie Gohmert of Texas mulls around the House floor before the speaker vote. Gohmert mounted a public campaign for speaker but failed to gain much traction. While 25 Republicans dissented against the Speaker during the vote - the largest number in recent memory - that tally was far below the amount necessary to force a second round. 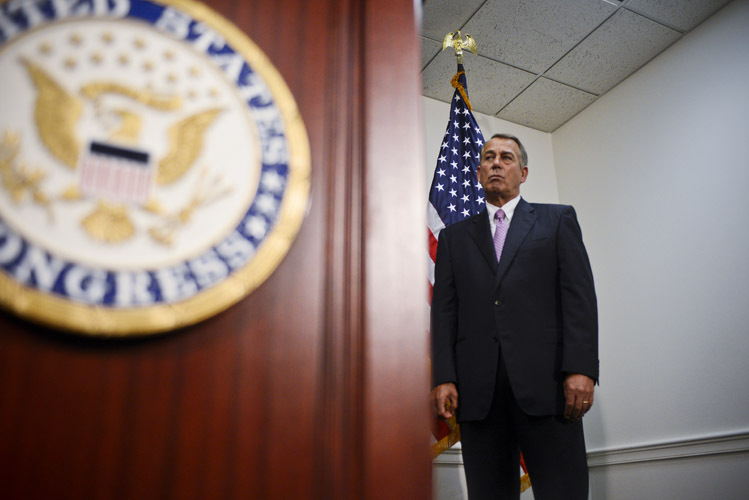 John Andrew Boehner is elected as Speaker of the House after one ballot. 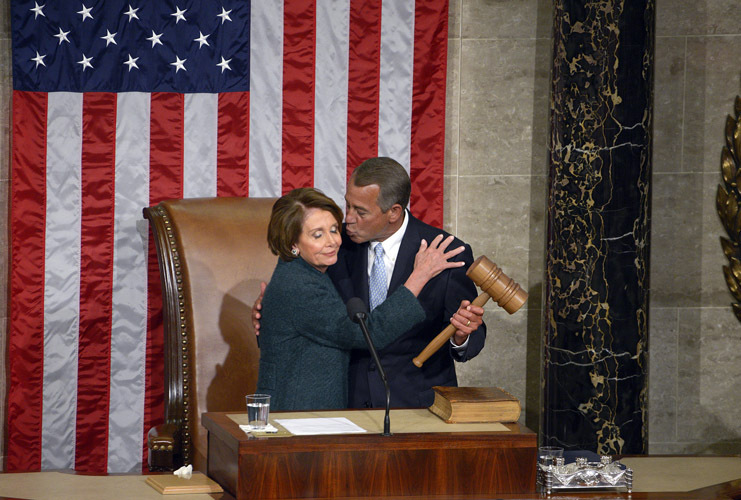 Rep. Nancy Pelosi, as the minority leader, ceremonially hands over the gavel to Boehner to start off the term. "A man of abiding faith, great heart and deep dedication. 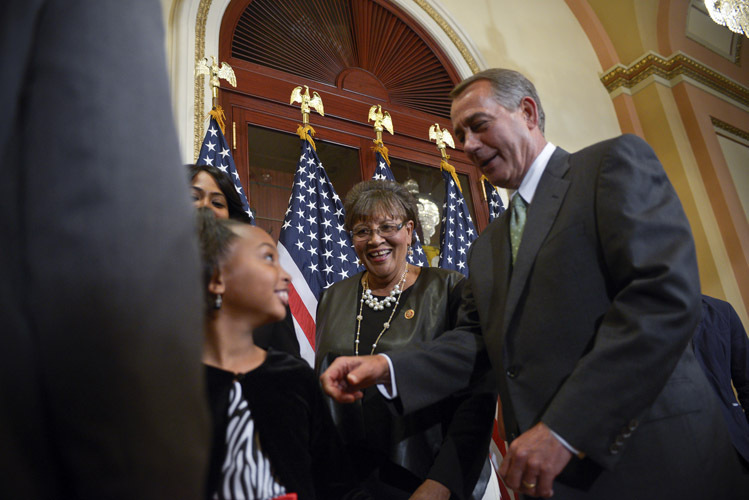 John Boehner is truly a gentleman from Ohio," she said. 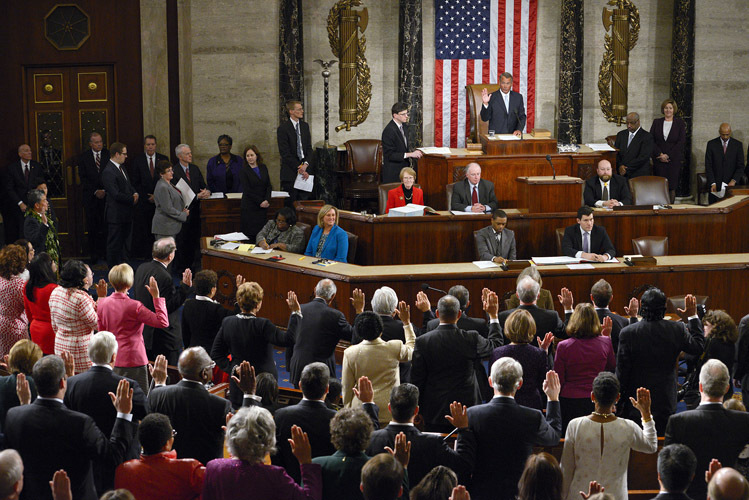 The Speaker leads the House of Representatives in taking the Oath of Office. Boehner spent the next several hours ceremonially swearing in all 247 members individually and meeting with their families. The first day of the session is one of celebration; the partisan battles will come later. The first few weeks for the House GOP leadership were mired in some controversy after it was revealed that early in the career of Majority Whip Steve Scalise, he spoke before a group associated with white supremacist David Duke. Scalise apologized and said he had not properly vetted the organization. 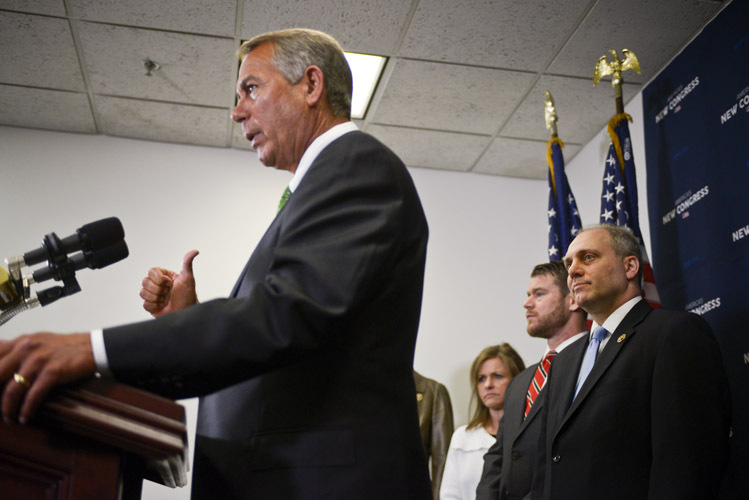 Boehner tells reporters that he accepts the apology and pledges his confidence in Scalise. 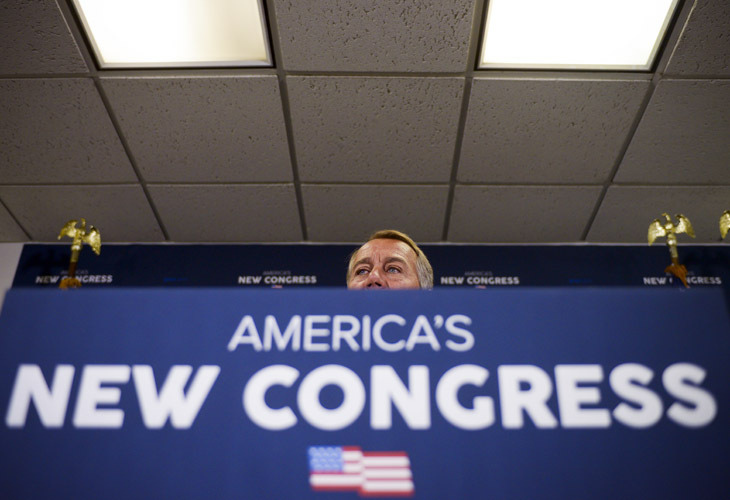 With a new logo to reflect the new session, Boehner holds one of his first press conferences of the new term. He pledged to usher in a new era of governance now that he had a partner to work with in the Senate: newly-promoted Majority Leader Mitch McConnell. 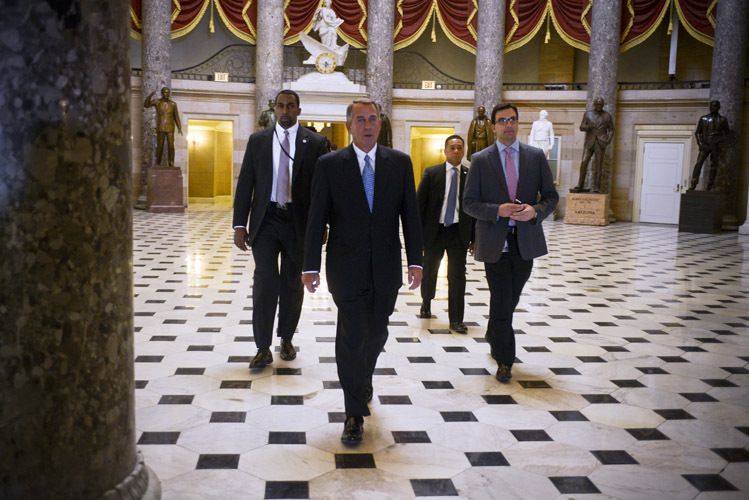 Boehner heads to the House floor before a crucial vote to avoid a shutdown of the Department of Homeland Security. Unexpectedly, an initial vote to extend funding for three weeks failed after 52 Republicans rebelled, refusing to vote for any bill without riders that defunded the President's deferred deportation programs. The GOP leadership scrambled to find an alternative. 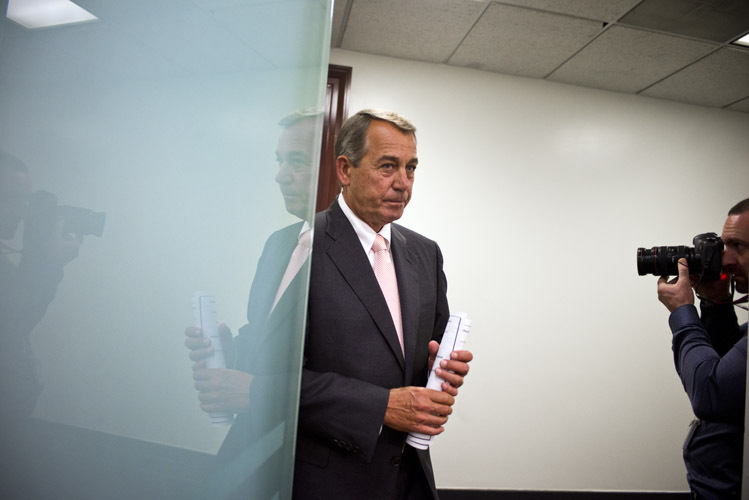 With just hours to go before a department shutdown, Boehner returns to the chamber. Over the objections of dozens of conservatives, the Speaker decided to negotiate with Leader Pelosi. The House fully funded Homeland Security without any immigration-related amendments, but the bill needed a majority of Democratic votes. The Speaker catches up with Vice President Joe Biden before the arrival of Japanese Prime Minister Shinzo Abe, who will make a joint-address to Congress. 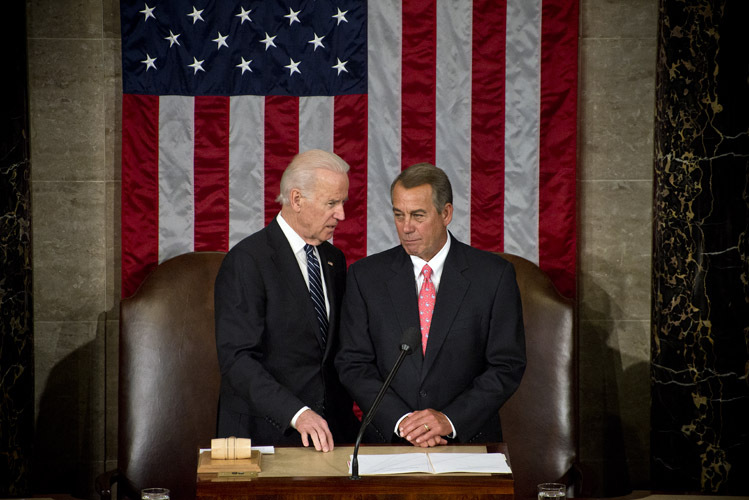 Boehner and Biden, as the the President of the Senate, preside over any joint-session. 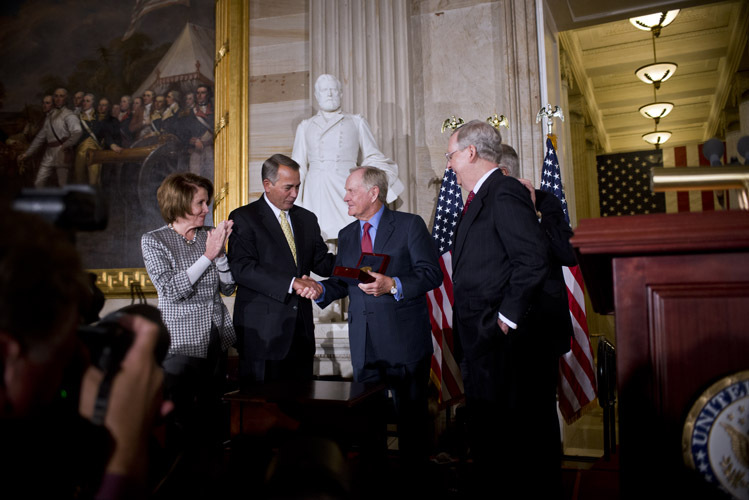 Boehner presents professional golfer Jack Nicklaus with the Congressional Gold Medal during a ceremony with the rest of the congressional leadership inside the Capitol Rotunda. Boehner arrives for a press conference where reporters ask if the Speaker can successfully pass the Obama Administration's request for fast-track authority to negotiate the TPP trade deal. Boehner supported the bill, but many Republicans were loathe to hand Obama greater powers and many Democrats had deep reservations on the deal. In the end, Boehner was able to keep his caucus together in support of the legislation, but the bill failed nonetheless. In a twist, it was Democrats who sank a bill the President supported.